Friendship wins the day in this story about two very different animals. Cat slept in the day. Dog slept at night. But every evening they met for their daily scrap. After their biggest fight ever, Cat and Dog decide to come out at different times. And guess what ... they miss each other! A heart-warming tale about an unlikely friendship and learning to accept others, even when they are different from you. Zoe Waring is a former winner of the Tigerprint Future of Design Award. A story about celebrating differences - a perfect tale for modern times. Helen Oswald grew up in Essex, in the UK. After graduating with a degree in English Literature from London University she qualified as a journalist, working in newspapers. She went on to become a writer and editor at a number of high profile organisations. Later, Helen studied for an MA in Creative Writing at the University of East Anglia, where she was tutored by former Poet Laureate Sir Andrew Motion. Her first book of poetry for adults, Learning Gravity, was shortlisted for the Forward Prize for "Best First Collection" - and one of her poems appears in an anthology on the English school syllabus. 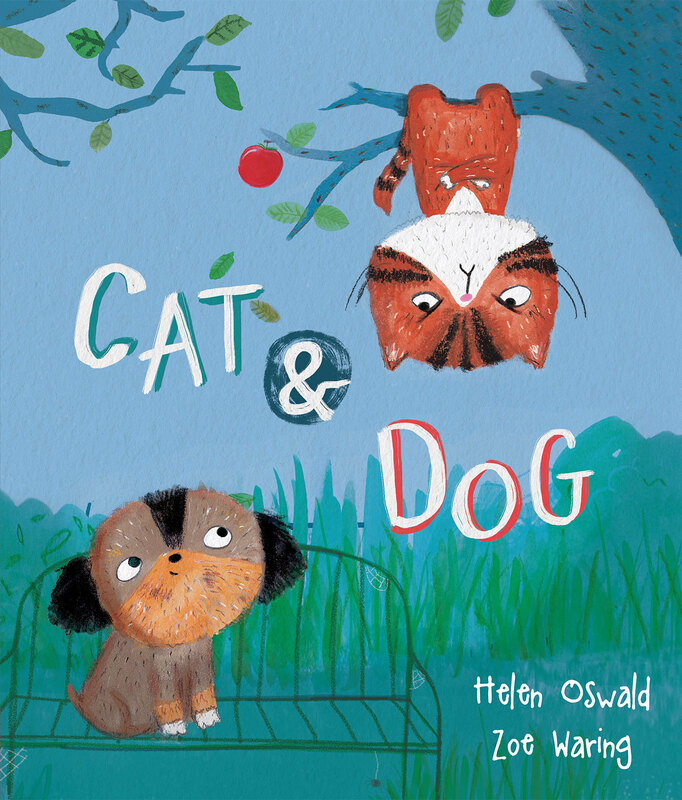 Helen has only recently started writing picture books for children and is completely smitten, loving the chance to create fun characters and be imaginatively playful. She lives in Brighton, on the South Coast of England. Helen tells us she does have plans to own some pets but since writing "Cat and Dog" and seeing the sorts of scrapes our furry friends can get into, she's been thinking more fondly of goldfish. Zoe Waring grew up in the small market town of Darlington, surrounded by children's books, colouring pencils and penny sweets. At University she studied Graphic Design, specialising in Illustration, and was highly commended in the Macmillan prize 2001. She then moved to London and won the Graduate Tigerprint Future of Design Award, and worked as a Designer and Illustrator at Hallmark Cards for three years. Her love for picture books blossomed and she went on to work as a picture book designer for Usborne Publishing, Random House Children's Books, Scholastic and Bloomsbury Publishing, while spending her evenings filling sketchbooks with her own cute characters, doodles and daydreams. In 2014, she took the leap from Publishing to focus on her true passion, Illustration. Loving the warmth and humour often found in children's picture books, Zoe loves creating engaging characters that help to tell wonderful stories. Now working in her sunny studio in Muswell Hill, London, she can still be found surrounded by children's books, colouring pencils and penny sweets.